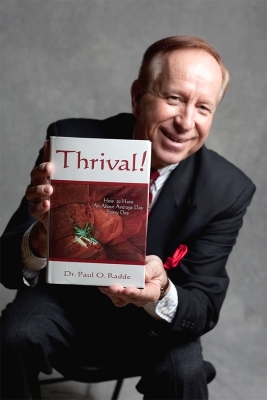 Dr. Paul O. Radde | The Thrival Institute | What is Thrival? Football legend Joe Montana was described by his teammates as a “luminescent presence” on the field. In short, when the pressure was on, the game on the line, Joe was present! He showed up. He was focused, alert, and responsive. His confidence, steadiness, and composure were contagious. Everyone settled down. By being present, this leader brought out the best in himself and his team, which resulted in outstanding success. When I consult and speak, I teach leaders, managers, sales reps, and individual contributors how to become more authentically present. Take this approach, and you will find that you are more focused, less stressed, and more resourceful. Like Joe Montana, you show up! In fact, you bring your best to the playing field, so to speak. Organizations get ahead when their leaders and employees really show up. When every team member brings ALL they have, totally and completely, to the task at hand, they are truly present. Being present is being mindful, focused, alert, and responsive. Being present is a sustainable life style practice that continually offers escalating, dynamic benefits – for individuals and the team. After a short-term, laser-beam intervention with me, you will see an acceleration in employee self-leadership, engagement, and team collaboration. What does “presence” have to do with Thrival? An important platform and requirement for thriving initially is being present in the moment. Thrival is the ability to move beyond the 3 major energy drains of shame, guilt, and fear in the workplace and in daily life to actually thrive. This enhanced state of being is the highest sustainable approach to living. Thrival matters, because having the richest experience of your life matters. In fact, I named this state of being, Thrival, based on an intense life experience from which I continue to learn, understand, and share. (Read about my personal journey) In my 40+ years of research and writing, I discovered that each of us can control many of the factors that contribute to feeling alive and vibrant in both our personal and professional lives. The field of positive psychology supports these facts. And I went one step farther. I realized that fostering Thrival in the workplace lifts everyone’s morale and spirits – and directly contributes to productivity and success. As an organization development consultant, I specialize in enhancing leadership, quality of life, professionalism, collaboration and interpersonal influence to create a thriving organization. The first step involves fostering an appreciation for Thrival knowledge, skills, and attitudes with employees at all levels of your organization, especially with key stakeholders who can advance this goal. I invite you to contact me to learn more. Put “thrival” alone in the subject line. I look forward to consulting with your organization and speaking to your group. "If you are going to customize this much, you will have to charge more."